If you scan the web for Coin Royale reviews or scam warnings, you might be surprised. All the reviews I’ve read rate them high – some as high as 8/10. Sounds like a great casino, right? Eh… not so fast. Coin Royale looks to be a decent casino, but I wouldn’t rate them higher than a 6.5/10. For starters they only have 5 games – on basic, plain, proprietary software. 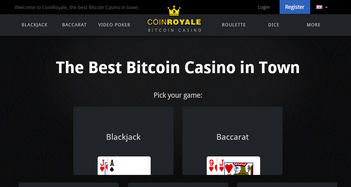 Most other btc casinos have way more games, so it’s extremely difficult to rank Coin Royale higher than them. That’s not to say they’re not worth checking out; they have some things going for them. It’s just that, for now, you need to adjust your expectations accordingly. For players who prefer smaller casinos with unique games, then they may well be a better option. One thing they have going for them is banking. More specifically, their minimum deposit is .001 bitcoin. Assuming my math is correct, that’s 40 cents. There’s no confirmation on deposits either, so you can put that 40 cents to work right away. Withdrawals are damn-near instant too – only one confirmation is needed. The only downside I caught is that you don’t want to leave your coins in your account for more than 6 months (without any action). Their terms state that they will close your account and ship you back your coins. They will try to get in touch first. If you think that’s going to be a problem, or you have any other issues on their site, you can reach them by email at: [email protected]. 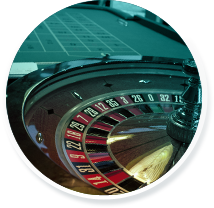 – we don’t offer a deposit bonus program, but you can try all of the games out on our free play mode. If you want to try with bitcoin just create an account and message me your account name and I’ll give you a few bitcoins to play with. What kind deposit/bets are you looking to play at? – We don’t have a VIP program but we are currently in the process of developing one. We do have an affiliate program though if you are interested. So it looks like there’s hope for improvement. They need it too. While they’re not the worst casino out there, they’re far from the best. That’s my opinion. But don’t let that stop you from checking them out and forming your own. Coin Royale offers 5 games. 5 GAMES! If you want a larger selection of games, might I suggest you read our BitCasino.io and PlayCoin Casino reviews. On the bright side those are loooow min. bets. That’s definitely great for players on a budget. And according to an email from Coin Royale support, they do have a slot game in the works. But all that does is round out their ‘large’ selection of games. I’ve also seen it mentioned that they have more games in the works. But that’s been the case for at least the last 9 months. So there’s no telling when they’ll actually get to it. On a brighter note their games are provably fair, which you can add your own seed to and verify after the hand/round is done. And every once in awhile they’ll run some tourney promo. For example, back in November 2013 they hosted a Baccarat tournament. The person that ended with the highest cumulative winnings ended up winning 1 BTC. So things aren’t all that bad. And the fact that 1 million hands/games have been played (as of September 2013) tell you that players like it here. 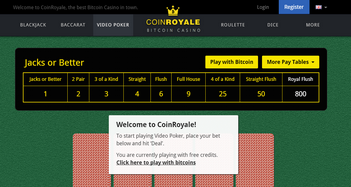 Like most bitcoin casinos Coin Royale uses HTML5 software. This is ideal because you don’t have to download any software to play. Now you can play from your browser – I recommend Google Chrome. That said, when I tested the software I found it to be painfully slow. 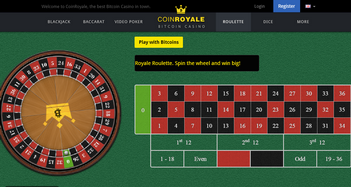 It works, but it’s not nearly as fluid as other bitcoin casino’s. In fact, I think you’ll find better looking and functioning apps on your phone. And you can play on your mobile device. I tested it out on both my iPhone and iPad. But, while the games are functional, it doesn’t look like they’re mobile optimized. Nothing fits the screen right. But at least it’s doable – not every bitcoin casino can say that. My rating above stands; I give them a 6.5/10 or a C+. They have a few things holding them back right now namely slow software, a small number of games and a lack of promotions. Because of this, there’s no competition between them and outfits like BetChain or Bitcasino.io. However, they plan to release more games and add some unique promotions, so fingers crossed and they won’t be behind the pack for too long. Furthermore, they have a low min. deposit threshold, instant deposits/withdrawals and semi-mobilized games. All these things compliment the boutique-type feel this casino has. While it wouldn’t be an obvious number one choice, you could do a lot worse.